Many students that present to us and are diagnosed with vision-related learning difficulties that can be greatly supported by minor classroom accommodations while enrolled in Vision Therapy. Below is our top ten suggestion list for classroom adjustments and modifications to help support efficient learning. Additional recommendations and alterations are frequently discussed and provided throughout the course of an in-office therapy program. For follow up questions and information, contact Okanagan Vision Therapy. The following suggestions are offered to help assist in the classroom. We understand that many will be intuitive for educators, but wanted to pass along recommendations that we find helpful for children with vision-related learning difficulties. As visual abilities improve throughout the course of therapy, some of the suggestions may no longer be as essential to school progress. 1. Movement to the front of the classroom and arranging seat direction so that the view of the smartboard is not from an extreme angle. 2. Encourage eye contact from students in all listening situations (when possible and appropriate). 3. Reduce conflicting peripheral visual stimuli. Removing materials unrelated to the task will increase attention. 4. Spoken instructions will be better followed if given singly, visualized and executed before the next instruction is issued. 5. Minimize smartboard to desk copying, and where possible, substitute with desk copy work so that the amount of time looking from near to far and back down is reduced. 6. Due to struggles with visual-motor integration, writing comfortably and legibly can be difficult. When possible, written homework should be reduced as it takes longer to complete than for a child without a visual issue. 7. Encourage the use of a pencil gripper to promote proper pencil position (if tolerated). 8. Where possible, use a sloping work surface (~22 degrees) for reading and writing. This will help to reduce visual stress, as our eyes are most efficient when aligned perpendicular to a page. 9. 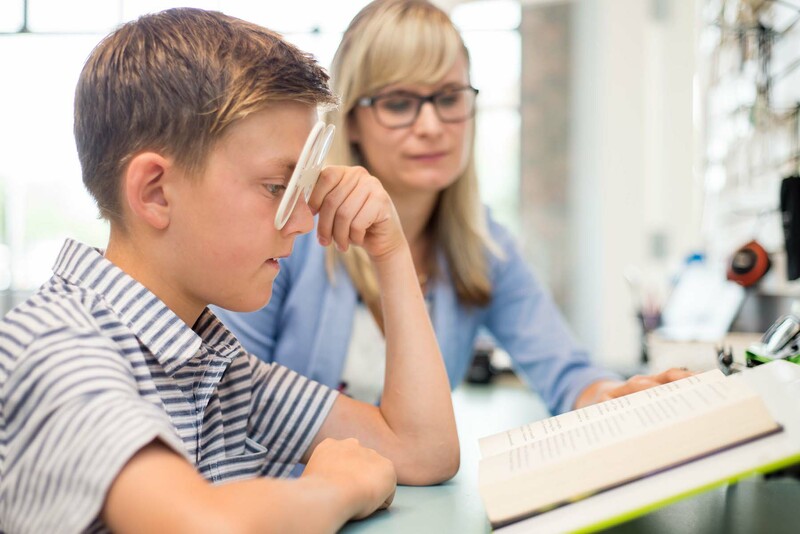 It is not uncommon for us to recommend the use of therapeutic, reading or classroom glasses. These are prescribed to reduce the amount of visual stress and tension that accumulates throughout the course of the day – encouraging their prescribed wear is extremely important. 10. Adherence to a working distance (eye to page) that is similar to the distance between our knuckle and elbow (known as the Harmon distance). Our visual system and eye tracking skills are most efficient at this the distance. Thank you so much for considering Okanagan Vision Therapy’s above recommendations. Please don’t hesitate to contact Okanagan Vision Therapy, conveniently located in downtown Kelowna, should you have any further questions.